While nodes, comments, blocks and many other things in Drupal are themed using theme template files (like node.tpl.php), forms are a different story. There are no theme template files for forms. How can I get a particular form to use a custom theme template? // Ex 1: the "story" node edit form. // Ex 2: a custom form that comes from a custom module's "custom_donate_form()" function. You're right, I've added it. Very important note is that, at the bottom of the code snippet, is print drupal_render_children($form) which makes the form actually do stuff :). Good answer. I can add that you need to specify additionally engine, if you are using something not default. E.g. 'engine' => 'twig'. @milkovsky sounds like you're in Drupal 8 – you may want to post an example if there are any other differences and tag it as such, I'm sure a lot of folks will appreciate that. Nice answer. Bear in mind if you want to theme an admin form such as user_profile_form or user_register_form. In that scenario you will need to either a) do your theming in the admin theme (or subtheme off of it if you can't change the base admin theme) or b) put your theming in a custom module. Otherwise your theming will not be seen. To theme a form, you can use a custom css, as explained in Themeing Drupal 7 Forms (Including CSS and JS). The #theme property is so very simple and is mentioned for the first time really low down in the answers, super weird. This is definitely my favourite method. I tested this code and it works as expected. I'm pretty sure you're able to use a template for forms, but you have to use hook_theme to register the template in the first place. I had a situation where the form really needed to be table based rather than div based and the simple #prefix and #suffix changes didn't really cut it. If interested I could probably try and dig up an example. I have actually never needed to use a template file for a form. As far as I can see, Drupal core code uses theme functions, when a form, or part of a form needs to be rendered in a particular way; a theme function that calls drupal_render() is normally enough for any purposes. To reply to the question, creating a template file for a form is not different from creating a template file that is not for a form. If the form contains the value $form['field_1'], its value will be available in the template file as $field_1. The template file will be also able to use any values passed from template_preprocess_mymodule_form(). How do I suggest a form defined by some other modules, possibly core modules to use my theme function/template? If what you need to style doesn't have an ID or a sufficiently accurate selector then it is necessary to use the hook approach to modify the HTML too add identifiers. Even though you may be able to use kiamlaluno's solution I personally wouldn't. What is your reason for needing a template file for a form? If it's because you want slightly different markup for an existing form? If so then you can use hook_form_alter() to modify the form before it is rendered. Using the Form API you you can modify all the form fields inject html elements etc. // Form modification code goes here. 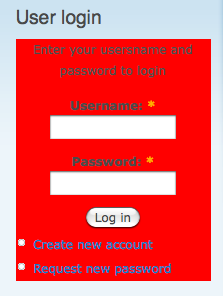 The above example wraps the entire form within a DIV which has an inline style to turn the background colour to red. It also adds a paragraph of help text to the beginning of the form. Just to clarify the use of inline styles in this example is just to simplify the example. I don't recommend using inline styles and you should use classes. I am not supporting using a template file for rendering a form; as a matter of fact, I also said that I have never used a template file to render a form (I have actually changed the code of a module that was using a template file for a form), and that Drupal doesn't use template files to render forms. What if you want to radically alter the markup? Sometimes a template file is a better option. Markup in a form logic builder smells. Drupal just LOVES adding html wrappers in every possible place and this often breaks any styling such as display:table-cell and the like. So it can be much better to create the slimline html yourself and have 100% control. I don't think it's that weird of a thing to want. [SOLVED] Theme Suggestion for overridding page-title.html.twig file? [SOLVED] Inline Entity Form - How to Theme the referenced form edit screen with a tpl.php file? Theme a form element in drupal with template file?